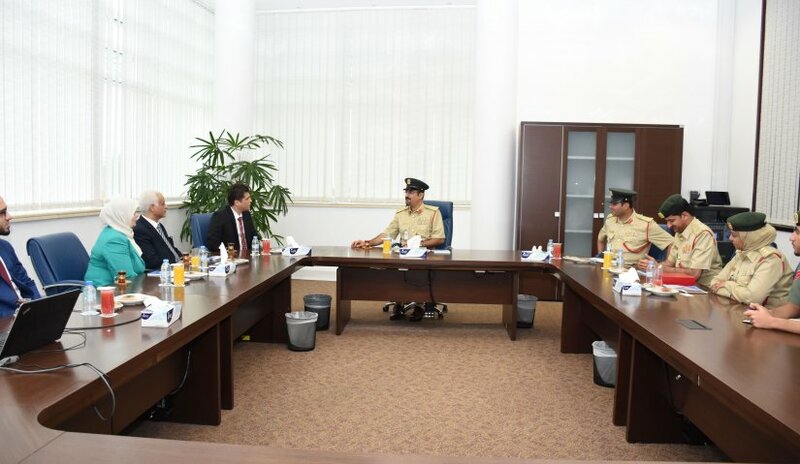 A delegation from Al Falah University headed by Dr. Sameer Al Barghouthi, Vice President for Academic Affairs, visited the Dubai Police on Sunday, 20th November 2016 to discuss aspects of cooperation and enhance the frameworks of partnership in the areas of scientific research. Brigadier Ahmad Mohammad Rafi, Director General of the Department of Human Resources welcomed the AFU delegation consisting of Dr. Barghouthi, Mrs. Ghada Walid, Director of Student Affairs Unit and Dr. Khalid Heneidi, Dean of the College of Mass Communication. The visit is to acknowledge the effort exerted by Dubai Police in ensuring the security and safety of the community through highly qualified and trained officers. For his part, Dr. Barghouthi gave an overview of Al Falah University’s involvement in community services and outreach. At the end of the meeting, the attendees stressed the need to strengthen relations for the benefit of the two parties and all educational institutions in the region.